WORTHING Football Club booked their spot in the Sussex Senior Cup third round following an emphatic 6-1 success at Mile Oak last night. Callum Overton bagged a hat-trick, while Omar Bugiel struck twice before Will Hendon rounded off the scoring. It could well have been a banana skin for Rebels against Oak who play two divisions below them in the Southern Combination League Division 1. But joint-boss Gary Elphick admitted it was a professional display from a fairly youthful side. He said: “It’s always nice to be in the next round of the competition. “I though it was a very professional display from what was quite a young side. “The game provided us with a chance to field some younger guys and they all did a good job. “We are now in the third round but we will just be taking round by round and then see how far we can go. Rebels made a fast start and went two goals ahead inside 20 minutes thanks to strikes from Bugiel and Overton. Overton struck twice more to complete a first-half hat-trick, before Bugiel notched a second as Worthing lead 5-0 at the break. 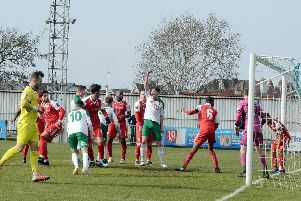 Oak pulled a goal back with ten minutes left through Jack Arnold but Hendon netted on 88 minutes to make it 6-1. Rebels were awarded a spot-kick late on but Overton saw it saved by Oak stopper Aaron Stenning. Worthing host East Grinstead Town in the Ryman League South on Saturday (3pm). WORTHING: Fagan; Hendon, Punter, Heath, Sparks; Quirke, Axell, O’Neill, Waller; Bugiel, Overton. Subs: Barnes (O’Neill), Hards (Axell). MILE OAK: Stenning; Gillingham, Sheldon, Lansdale, Whiting; Skinner , MacDonald, Garrod, Arnold; Shepherd, Wedge-Bull. Subs: Pullinger, May, Pulling, Austin-Slade, Burnett.